One whiff from the package, and hubby and I were in love. A deliciously jammy fragrance greeted us. As expected, the leaves had that mottled brown and gold appearance. We followed the vendor’s recommendation to steep in boiling water and did two steepings, the first for 3 minutes and the second for 3½ minutes. As with other versions of this tea, we ended up with a beautiful reddish-brown liquid in the cup that had a heavenly malty/nutty aroma and a nutty flavor. There was a hint of astringency, but it was easily smoothed with milk and sweetener, which also brought out the maltiness more and even made it somewhat caramelly. This tea has a limited production time (from about the last two weeks of March through about the first two weeks of April) and is composed of tippy, neat, wiry, and well-made leaves. This means it requires careful hand harvesting by knowledge workers. Yunnan, the Southern Chinese province bordering Vietnam, is said to be the birthplace of tea, and also the location of the oldest wild growing tea tree (thought to be 1,700 years old). More black tea is produced there than in any other tea-producing part of China, although they’ve been doing it a much shorter time starting in 1939. Flavor characteristics such as “peppery,” “earthy,” and “cocoa-ish” are often attributed to such teas. Hubby and I found this one more toward the richly nutty, malty, caramelly side and were quite pleased with that. 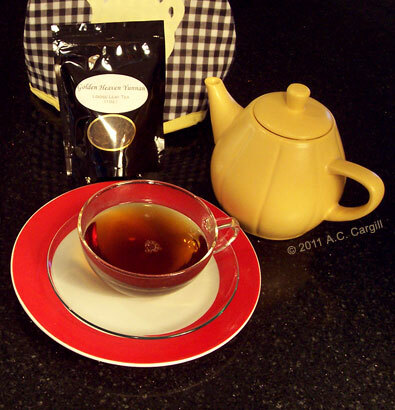 One final note: As I have recommended in many reviews in the past, you should play with the steeping times. Our second steeping was lighter than the first, which means a shorter first steep might be in order. On the other hand, maybe a longer first steep is better, giving you a more robust cuppa, especially if you put milk in it.